All you need to know to enjoy your stay in Malacca Malaysia. Learn all about my new hometown Malacca in Malaysia: a good Malacca map, all the tourism things you can see in Malacca and what I and my friends think about Malacca hotels. Map of Malacca Malaysia: read more info about the numbers on the map below. You can easily reach Malacca by car using the North-South Expressway linking Alor Star in the north to Johor Bahru in the south. Accommodation in Malaysia is always a plenty with Malacca hotels for every budget. My favorite is the Renaissance Hotel, but we will talk about all resorts and hotels in Malacca in further more detailed posts. 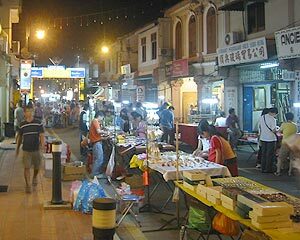 Most of the tourist attractions in Malacca can be easily found in Malacca’s small city centre. You can stroll down Jonker’s Walk: a row of shop-houses of Peranakan architecture and for sure visit again during the evening and to try out some delicious Malaysian food on its night market. In Bandar Hilir area, The famous A Famosa Fort is located in the Bandar Hilir area where also some paid museums can be visited. Another nice walk is towards Pulau Melaka. Pulau being the Malay word for ‘island’. 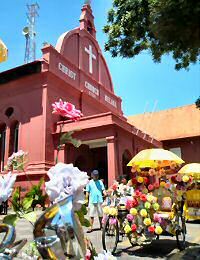 Pulau Melaka is an island formed through land reclamation mainly for real estate and housing purposes. To reach the island, you just cross a causeway leading to it. Find Masjid Selat or the Strait Mosque completely at the end of Pulau Melaka. Pulau Besar, which can be reached from the Anjung Batu jetty at Umbai. In stead of walking through the tropical heat, you can also take a pricey trishaw to get around. But we recommend you use the much cheaper bus “Bas Panorama Melaka” to visit any or all the tourist places in Malacca. Jump on the bus at Melaka Sentral and it will bring you to Old Bus Station, Gajah Berang, Jonker Walk, Bandar Hilir, Kampung Portugis, Bukit Baru, State Mosque, Giant Hypermarket and of course back to Melaka Sentral. Jump of the bus at any Malacca place of interest and hop on again when the next bus arrives. 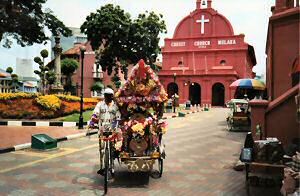 The city of Malacca is the center of Malay history. 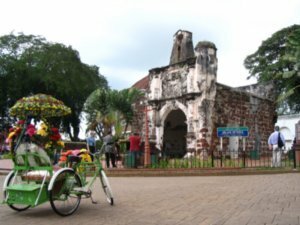 In the 15th and the 16th century, Malacca was the capital of the Malaccan Sultanate after the Malays moved over from Sumatra. However it was colonized by the Portuguese in 1511 and there-after by the Dutch and of course the British. After World War II, Malay nationalists fought for independence. On 20 February 1956 the announcement of Independence was declared at Padang Pahlawan (Warrior’s Field) at Bandar Hilir in Malacca. Many Malaccans have since then moved to Kuala Lumpur and to Singapore. 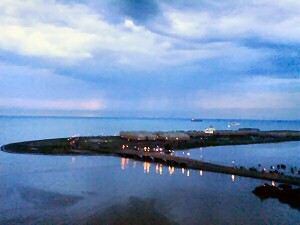 Especially Singapore’s harbour took over the silting up port of Malacca. Malacca simply stands at the origin of Malaysia, although it has seen better times. Malaysia property cycle and how to mitigate its risk? Property Agents/Negotiators – A Blessing and a Pain? This site shows you Melaka Malaysia seen through the eyes of a retiree - Hantu Putih in Malay... - staying in Malaysia under the MM2H program: a 10 year multiple entry visa to Malaysia. Malaysian are very friendly, Malaysia has no winter and you can stretch your European dollars even more in Melaka than in the capital Kuala Lumpur or in the MM2H town of preference: Penang. Malaysia My 2nd Home (MM2H) is a 10 year multiple entry tourist visa for retirees, planning to retire and buy property in Malaysia. Read the latest news and updates about the Malaysia My 2nd Home Programme.